At the end of the first century AD, the Greek mathematician Heron of Alexandria missed the chance to explore a brand new area of mathematics. He was interested in frustrums – truncated pyramids with a square base and top, joined by straight sloping sides. 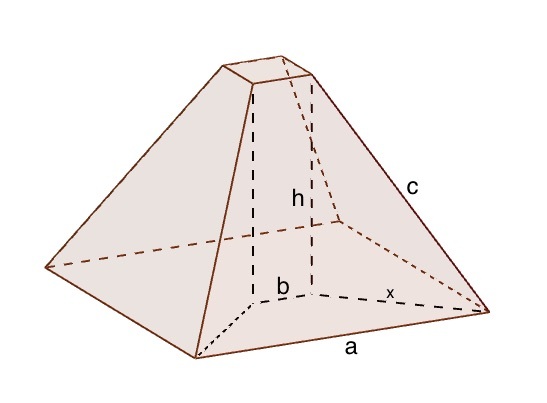 In his book Stereometria he asked the question: If the length of the sides of the square base is a, the length of the sides of the square top is b, and the length of the sloping edges running from top to bottom is c, how high is your frustum? This frustrum is drawn with the values a=10, b=2, c=9 and h=7. Heron had managed to come up with an impossible example: no frustrum with these measurements could exist. But he had also come up with the first recorded example we have of a calculation involving the square root of a negative number, a complex number. The answer was recorded in his book, however, as . We don't know if he deliberately set his jaw and ignored the strange result or simply made a mistake and didn't notice. But he definitely missed his complex opportunity.